In one of my Daily Inspirations post for January, I talked about a semi-cringe-worthy Valentine’s Day card I chose specifically for my grade school crush. It’s so silly that it makes me laugh out loud every time I think about it. Oh, if only I could find a card like that and give it to my forever Valentine today. 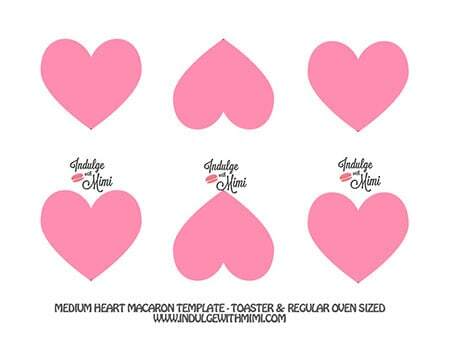 In the absence of such a card, let’s just bake sweet macarons for the loved ones in our lives. 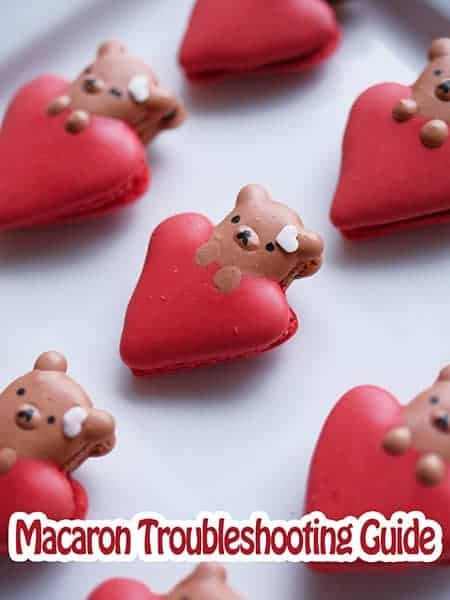 For the longest time, I thought that Valentine’s Day in my adult life was meant to be celebrated with the person I was romantically involved with. It was only until I started to receive little tokens of love from friends, colleagues and children that I started to consider it a somewhat inclusive holiday. 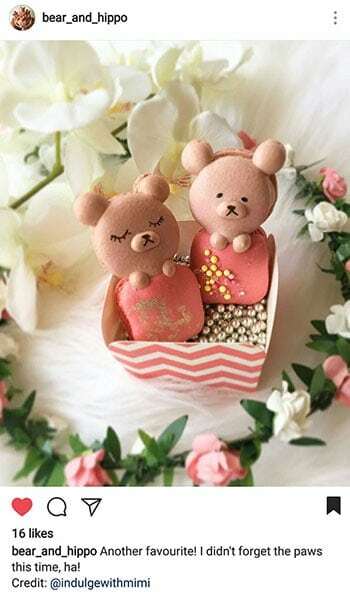 It’s a day that you can use to show others your appreciation and love. Well, that’s what the chocolate and flower companies want us to believe right? 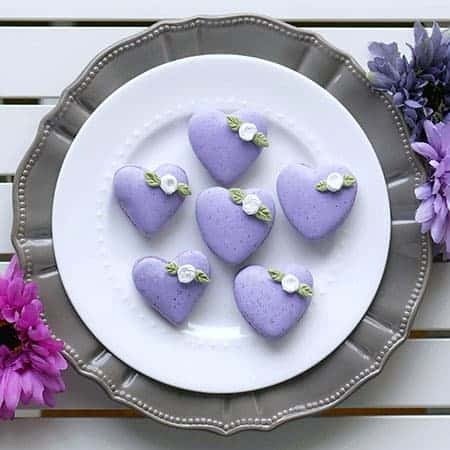 The more people we can get in on the retail action, the better 🙂 I think Bill Maher said it best: “It’s the one day when the whole country is telling you to buy flowers.” Instead of flowers this year, maybe you can try your hand at making this sweet treat from the heart. 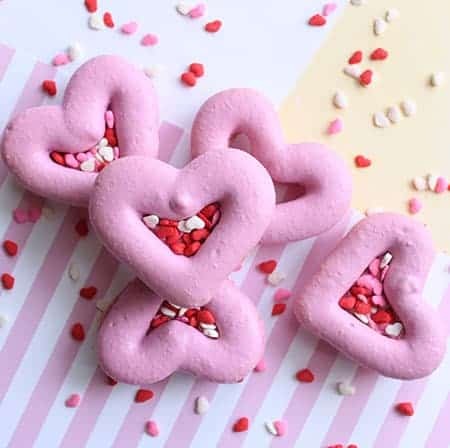 I made this Ultimate Guide to Making Valentine’s Macarons for you. 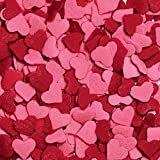 I hope it will help you get started and offer you some V-day inspiration. 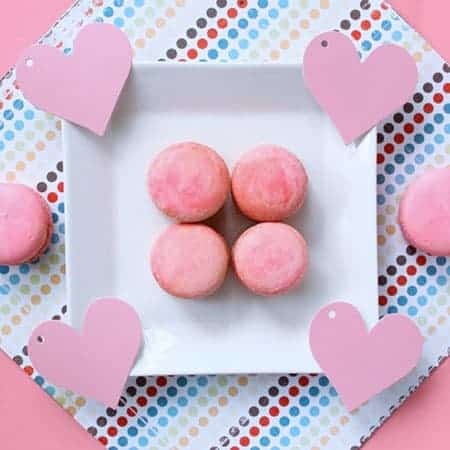 To save time and make sure you achieve success with your Valentine’s macarons, you’ll need a good reliable macaron recipe. 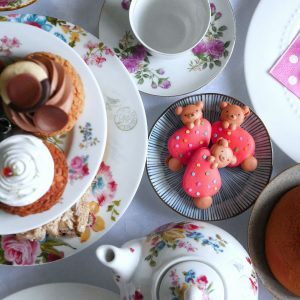 If you don’t currently have a go-to macaron recipe, here is my Best Macaron Recipe with detailed instructions and a video tutorial. 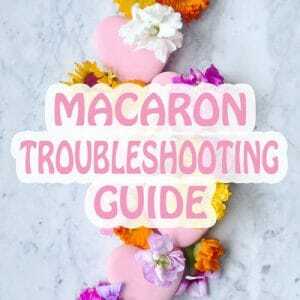 And if you run into problems with baking your macarons, take a look at this handy macaron troubleshooting guide. 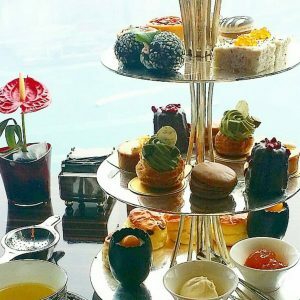 It explains some of the reasons behind wrinkly, cracked, hollow macarons and more. 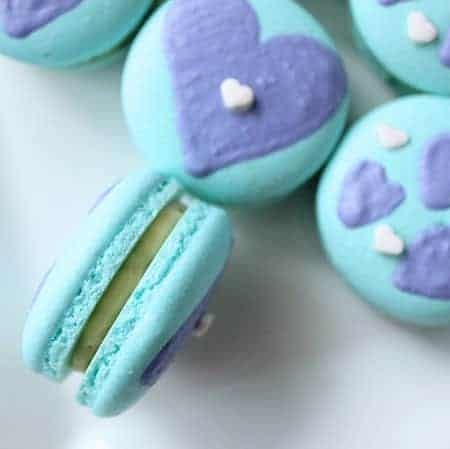 Earl Grey Macarons with Lemon Buttercream Macaron Recipe. 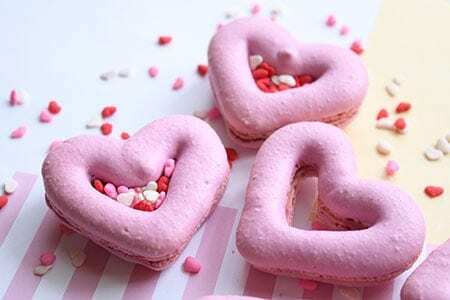 Here are some Valentine’s Day macaron inspiration for you. 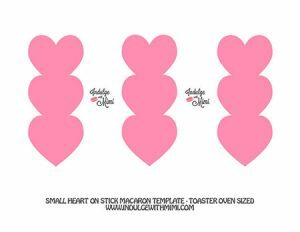 All of these projects have an accompanying macaron template which you can download and use to pipe with. They are all available for download for Newsletter Subscribers. Just sign up for the newsletter and wait for the double opt-in confirmation email. Confirm your subscription and you’ll be sent the password to the Subscriber’s Only Area. 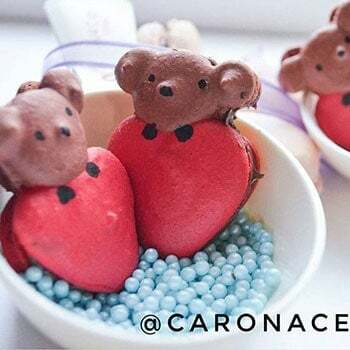 Follow my BEST MACARON RECIPE for the step-by-step instructions to creating a strong and healthy macaron batter that’s perfect for piping macaron art. 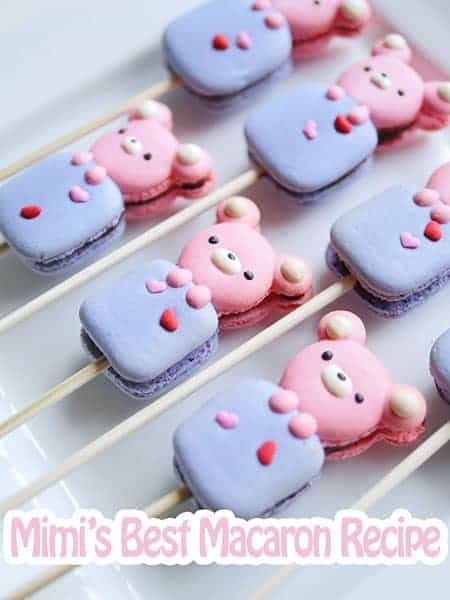 Prepare all the ingredients in advance in order to make two batches of different colored macaron batters back to back. Here’s how I like to create 2 different colored batters. 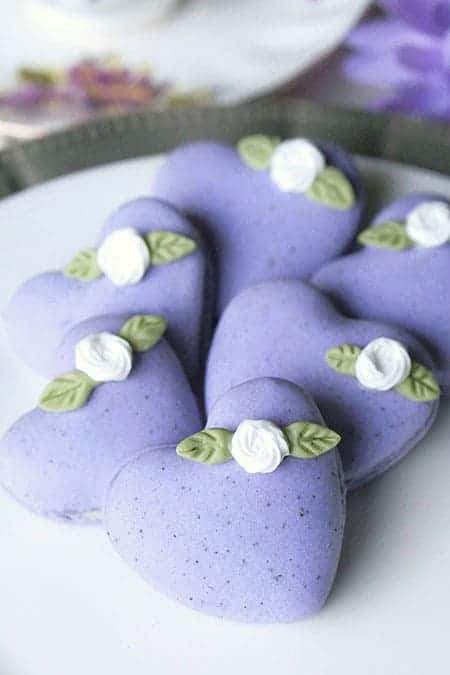 These Earl Grey heart macarons were filled with a mouthwatering lemon buttercream. 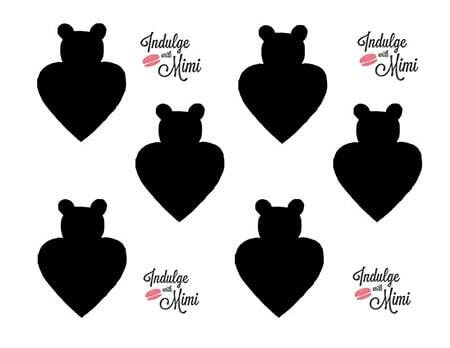 The hearts were piped with the small heart template provided below. Once baked, sugar roses and fondant leaves were applied to the top with edible glue. Recipe to the Earl Grey Macarons and Sugar Rose Tutorial here. 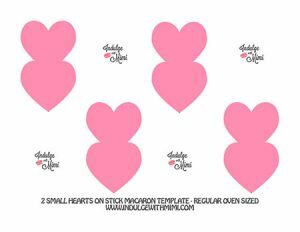 These open-heart macarons were piped using the medium heart template provided above. 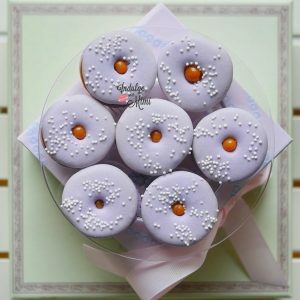 To eventually fill them with sprinkles after baking, pipe a solid heart for the bottom shell and pipe an open heart for the top shell. 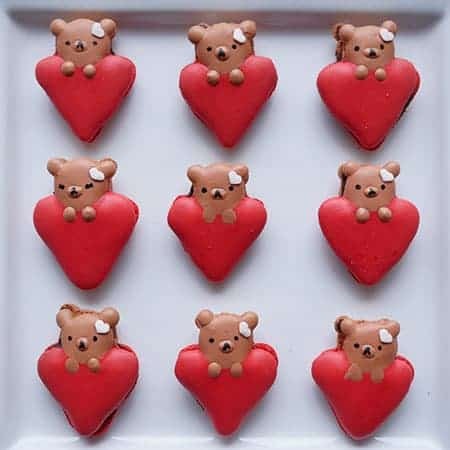 You can also leave it an open-heart design by piping an open-heart for both top and bottom shells. Who says V-day has to be all about pink and red? 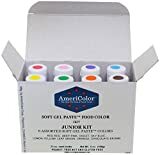 You can also try non-traditional colors in pastels such as aqua and purple. This is a batter-on-batter technique. The aqua macaron batter was piped first and once it develops a thin skin, the purple was piped on top. Marbled pink macarons can be achieved by following my Galaxy Macaron tutorial and mixing up the batter a bit more before sealing the piping bag. 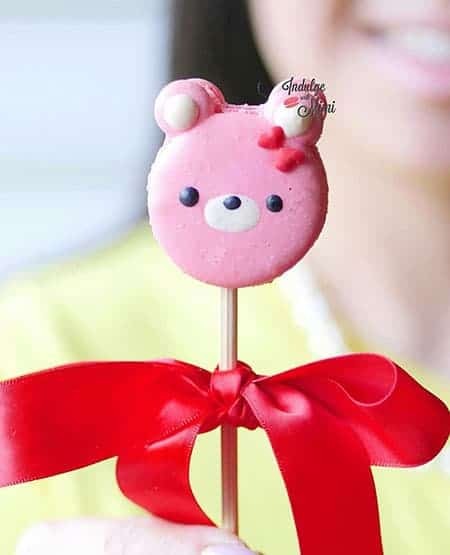 Bear bear macaron pop using the batter-on-batter technique. 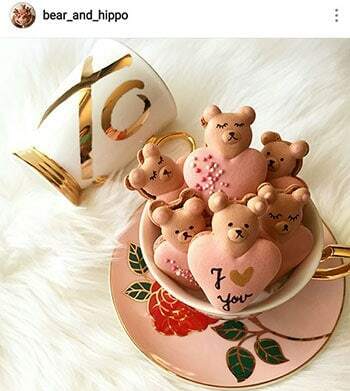 Follow my Rilakkuma Bear Macaron tutorial to learn how to make 3D macaron art. 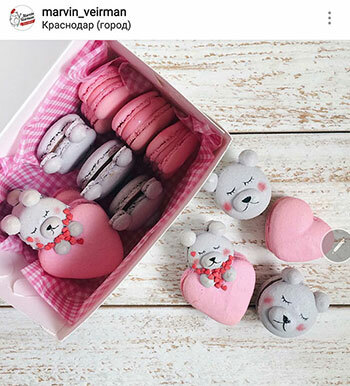 If you already know how to make 3D macaron art, follow this piping order to make these bear macarons hanging onto their huge marshmallows. Prepare macaron batter in three colors: white, purple, pink. Pipe marshmallow with purple batter. 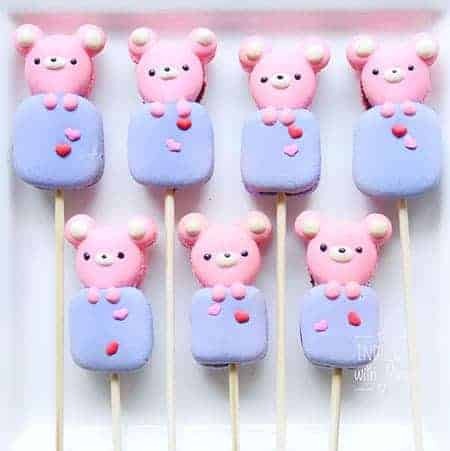 Apply sprinkles onto marshmallows before a skin develops. Pipe head with pink batter. Once the head develops a thin skin, pipe the ears. 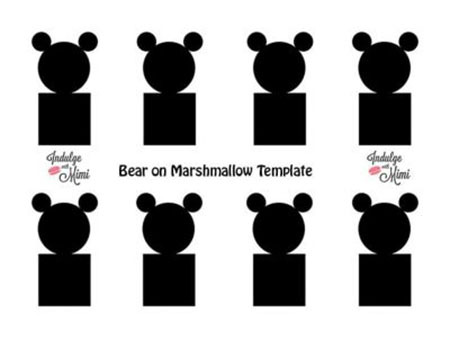 Once the marshmallows develops a thin skin, pipe the paws directly below the bear’s head. 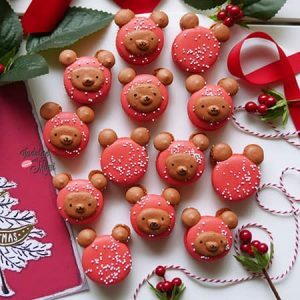 Pipe the bear’s snout with white batter. Fill in the ear details with white batter. Wait until your macaron dries completely before baking. 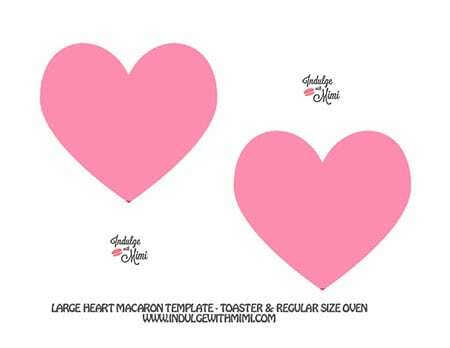 Using piping tip Wilton 10 and my small heart template, squeeze a dollop of pink macaron batter into the rounded curve of the heart on one side. You don’t need it to fill entirely as it will spread later. Pipe slowly on a slant while decreasing the amount of pressure as you move further down to the tip. 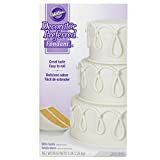 To stop piping, flick quickly back upwards towards the center. Do the same for the other side. Smooth out further with a toothpick. Once you’re done piping, baking and filling your macaron art, you’ll need a pretty box to put them in. 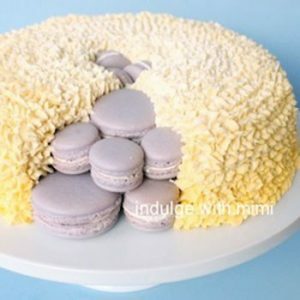 Here is a tutorial that will teach you how to make a flat box which has a window for visibility and is shallow enough to show off your beautiful macaron art nestled inside. 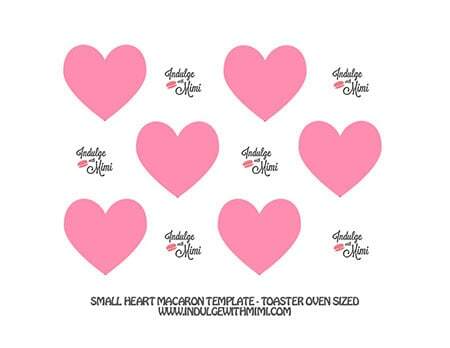 Finally, here is a handy list of supplies that will help you complete your Valentine’s macaron projects. 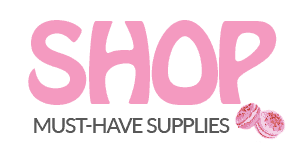 Disclosure: These are affiliate links. 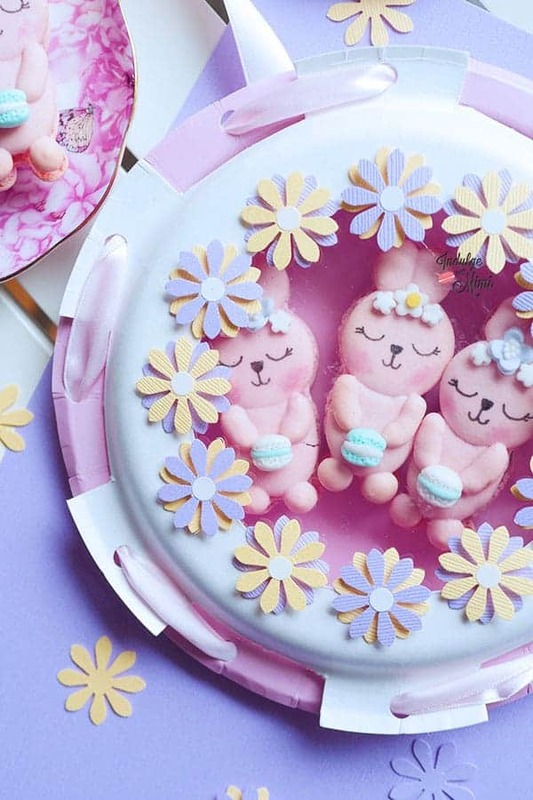 Take a look at these wonderful creations by the following readers. Thank you so much for tagging me! 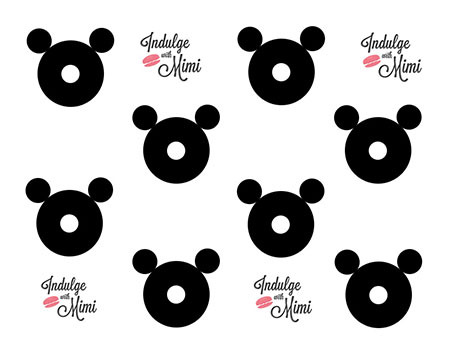 Hi Mimi love your page! I tried silpat many times and have problem with it! Macarons stick to it may be under cooked. I baked another batch for extra min macarons were crispy. I bought oven thermometer would that work? And how long should I bake them for? Top middle or bottom oven? thanks ?? The time, temperature and method I use is all on my best macaron recipe tutorial. 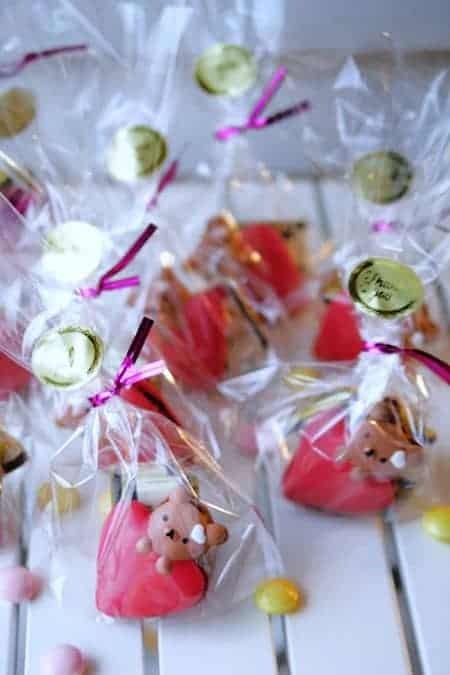 If the macarons are sticky, they need longer back time and if they’re crispy, mature it with the filling for a longer time. I tried these. They are amazing. Your blog is very good and comprehensive in the sense that it even covers oven issues. Love it!! Thank you so much! I’m so happy you got a chance to try it! I love when the templates get used and new creations come from them. Hi Mimi! 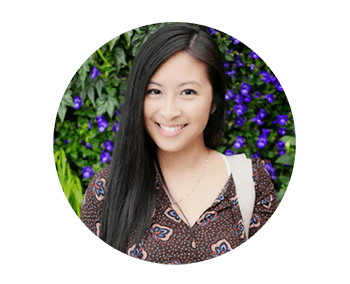 I’m loving your site and your super creative macarons! I tried laudree’s French method when I first started and just couldn’t get it down so I switched to the Italian method. I randomly decided to try the French method again, using your recipe and had amazing sucesss!! I’m so excited! 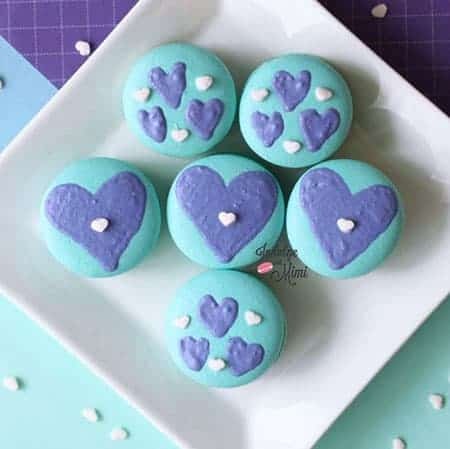 I have a question for you, when you’re making character macarons and just need a little color, it seems like you make an entire batch of just that color, is that correct? Do you just have everything ready and quickly whip up another batch of colored meringue? 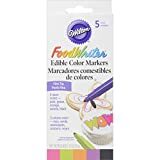 Just curious, I hate to make so much batter when I just need a little bit of color! Yes, i have extra mixing bowls and whip up another batch right away after the first set of color is done.